Jonzi D Projects Presents The Letter: To Be Or To MBE. Jonzi D (read interview), the UK’s best known exponent of Hip Hop theatre, presents his acclaimed solo show The Letter. This true and topical tale of one man’s dilemma regarding a proposed MBE honour is told via Jonzi’s sharp and often hilarious portrayal of his friends, colleagues and family. Showcasing his signature verbal and physical skills, Jonzi D utilises movement, political observation and humour to explore the concept and prospect of this unexpected accolade. 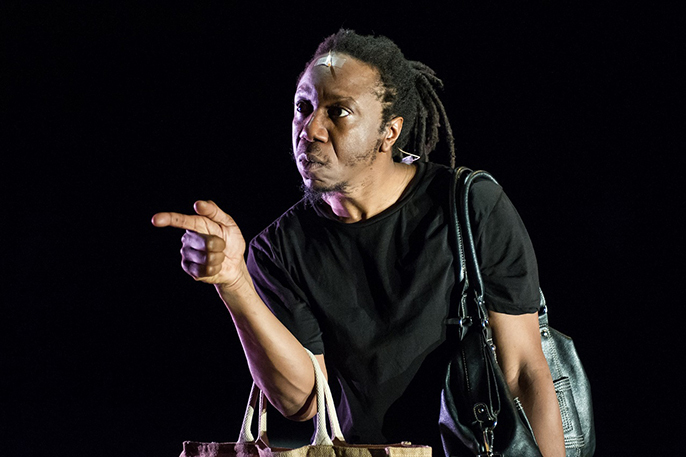 As an authentic East Londoner of Afro-Caribbean descent, his own feelings are as diverse as the various characters he brings to the stage. The MBE letter requires a response and just to complicate matters, everyone has an opinion. From the impressionable, husband-seeking house guest to the East London rhyme-spitting weed dealer, Jonzi is confronted by opposing views and gut reactions. His childhood neighbour thinks one thing, a militant friend uncomfortable with an Empire-related honour another. Should Jonzi be swayed and what does an MBE represent anyway? What will his esteemed supporters in the arts think if he rejects it? More to the point, what will his family say? Whilst his eldest sister might not reside in Buckingham Palace she does after all, reign supreme within Jonzi’s family. Colourful and warm yet outspoken and at times subversive, The Letter paints a highly personal picture of the ultimate predicament: To be or to MBE? Jonzi D is a renowned MC, performer, choreographer and director. He’s been actively involved in British Hip Hop culture and performance since the 1980s and is artistic director of Breakin’ Convention, Sadler’s Wells’s international festival of Hip Hop dance. Breakin’ Convention has been a runaway success since starting in 2004, travelling as far afield as Harlem’s legendary Apollo Theatre. Jonzi’s own devised work includes Aeroplane Man, Tag and Markus The Sadist. The Letter successfully toured the UK in 2013-14.